Thankful for Carrot Cake | Oh, the Places We See . . . In order to pull our family together on the same day, we’re celebrating Thanksgiving on Sunday rather than when everyone else does this Thursday. Not a problem. The older we get, the more we realize it really doesn’t matter when you get together, just as long as you do. We’re having the usual — roasted turkey, Southern cornbread dressing, cranberry casserole, and corn soufflé — but adding something new this year: Carrot Cake. So, here’s a little Thanksgiving gift from us to you: Joy’s Carrot Cake. Cake: Blend together eggs and oil. Sift sugar and other dry ingredients together. Add to egg mixture, mixing well. Add carrots. Blend well. Pour mixture into 2 9-inch cake pans which have been greased and floured. Bake at 375 degrees for 30-40 minutes. Happy Thanksgiving to you and yours — no matter when you sit down to celebrate together! 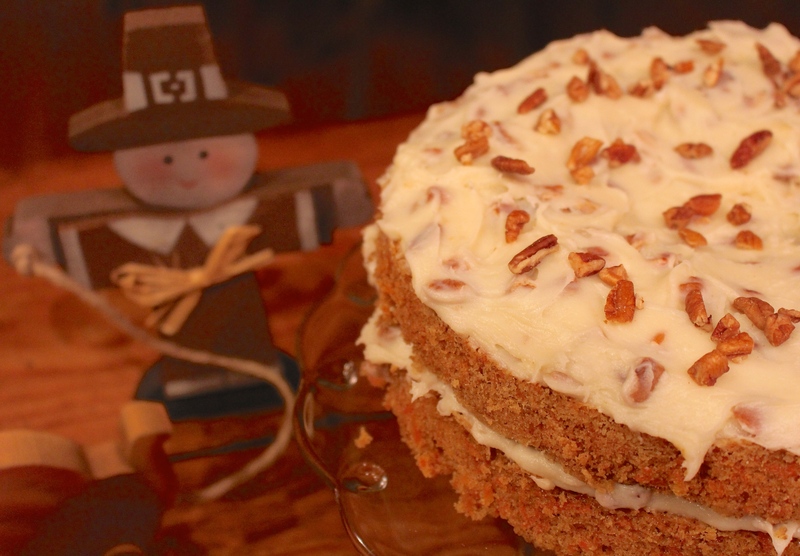 This entry was posted in Recipe and tagged Carrot Cake, Joy McCabe, Live at Five at Four, Thanksgiving, WBIR. Bookmark the permalink. I am a huge fan of carrot cake, thanks for following my blog and for the ingredients for this great way to celebrate Thanksgiving 2014. You are quite welcome! If you try it, let me know what you think. Mine was very moist and it’s lasted all this week — except for the slim, “just one more” slices I’ve shaved off! You’re quite welcome. Of course, I shouldn’t have made it. Now I take a little nibble from the leftover cake whenever I pass by! Try the recipe — it’s moist and good. Happy Thanksgiving! Love the recipe! I wish I could find a quick and easy way to grate carrots! Donna, I feel your pain! There really isn’t a quick way, but the most expedient for me was using the food processor. Of course, you still have to get out all those attachments and then wash them, but once you taste that cake, you’ll forget the trouble! Happy Thanksgiving! Delicious recipe, I have not bake carrot cake for a long while 🙂 Thank you for sharing, Rusha! And you as well, Curt. What a blessing to have online friends! Carrot cake is my favorite. Yum! It’s one of our favorites too . . . right beside Hershey Cake, coconut cake, caramel cake, sour cream pound cake . . .
Lol! All of those sound amazing right now. Yummy! Piggletino wonders how it tastes! I can let you know after we serve it tonight, but those pan scrapings were awfully good — moist and sweet. Thanks for commenting. Happy Thanksgiving.